Healthy carotid arteries, one on each side of the neck, bring oxygen-rich blood to the front part of the brain responsible for your personality, speech, judgment, problem-solving, body movement and intelligence. 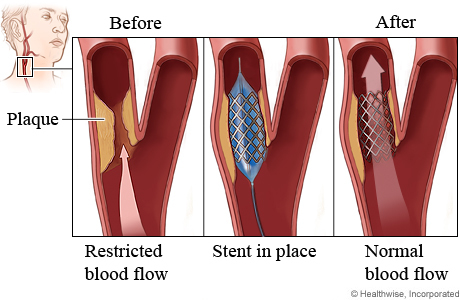 A waxy buildup of plaque (fatty substances and cholesterol) that narrows the arteries, however, increases your risk of stroke – the second-leading cause of serious long-term disability and the fifth-leading cause of death in the United States. 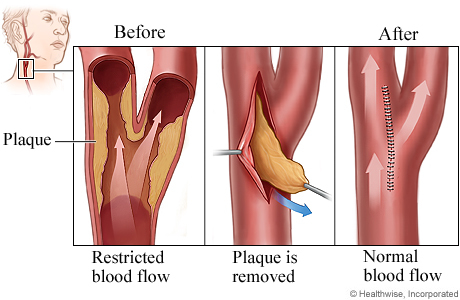 The waxy buildup and hardening of the arteries, a condition known as atherosclerosis, is the primary cause of carotid artery disease. Numbness or weakness in part of the face, arms or legs. Vision difficult in one or both eyes. Severe headache that starts suddenly. Elevated levels of sugar in the blood (diabetes or insulin resistance). Coronary artery or peripheral artery disease. 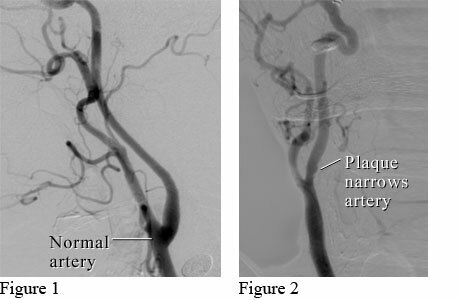 Plaque can form where arteries were damaged. Besides causing blockages, flakes of plaque can break away and travel to the brain. Or the plaque can rupture, allowing blood-cell fragments (platelets) to accumulate and possibly form blood clots. Among people under age 75, men have greater risk. Among people older than age 75, women have greater risk. Diet high in saturated and trans fats, sugar, sodium and cholesterol. If tests reveal a carotid artery blockage of less than 80 percent, your doctor will monitor your condition with an ultrasound at least once a year. The rest is up to you. Fat-free or low-fat dairy products, such as fat-free milk. Fish high in omega-3 fatty acids, such as salmon, tuna, and trout, about twice a week. Fruits, such as apples, bananas, oranges, pears, and prunes. Legumes, such as kidney beans, lentils, chickpeas, black-eyed peas, and lima beans. Vegetables, such as broccoli, cabbage, and carrots. Whole grains, such as oatmeal, brown rice, and corn tortillas. A lot of red meat. Saturated Fat: Red meat is a primary source. Trans fat, or trans fatty acids: Foods with hydrogenated oils and fats. Check the labels on baked goods, crackers, stick margarine and other foods. Your goal: Limit saturated fat to no more than 6 percent of your daily calories. A 2,000-calories-a-day diet should cap saturated fat at 13 grams. Control your blood pressure, blood sugar and cholesterol levels. Aspirin and clopidogrel, sometimes together, are among the medications your doctor might recommend to prevent blood clots that can lead to a stroke. If lifestyle changes don’t help control your cholesterol, blood pressure, blood sugar or anything else that might contribute to carotid artery disease, you doctor can prescribe medication to address those issues individually.